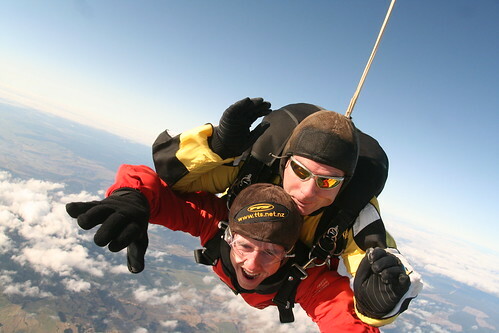 It's hard to believe that hurling yourself out of a plane from 15,000 feet would be on anyone's agenda, let alone backpackers on a budget. 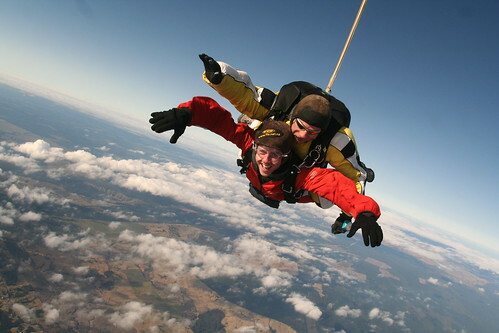 Skydiving isn't exactly the cheapest hobby, although I know a couple of people that do it regularly in the UK. 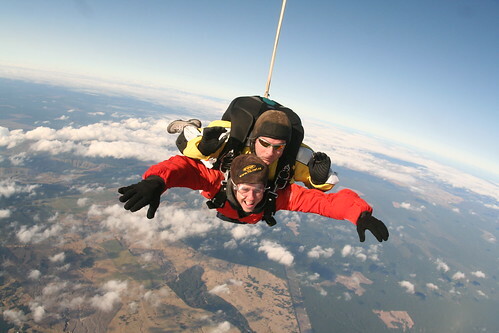 Happily, Taupo is the skydiving capital of the world and just as Koh Tao is the cheapest place to learn to scuba dive, Taupo is the most wallet-friendly option if you are feeling a little giddy and want to jump out of a plane. 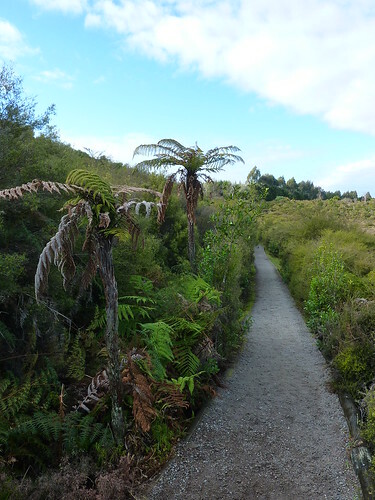 There is the added bonus, of course, that the views of the area - including the magnificent lake of the same name - provide even more bang for the kiwi buck. It didn't go quite to plan to begin with. Weather plays a fairly important part in skydiving and if there's too much cloud cover then it's simply not possible to jump. 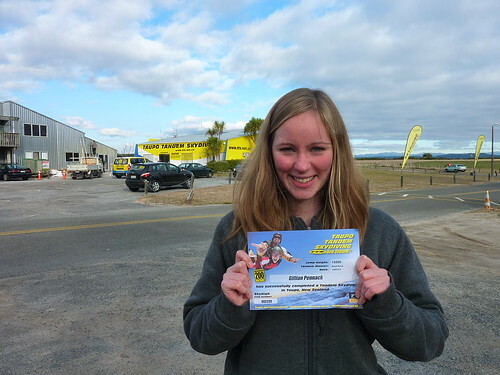 The company we had chosen - Taupo Tandem Skydiving - had asked us to call a couple of hours before our 10am jump to ensure things were still going ahead. We must have summoned some English weather over to the island, as the clouds were thick and TTS decided that it was too risky to fly in, so postponed the jump for a couple of hours. As can be expected, this helped our nerves no end. 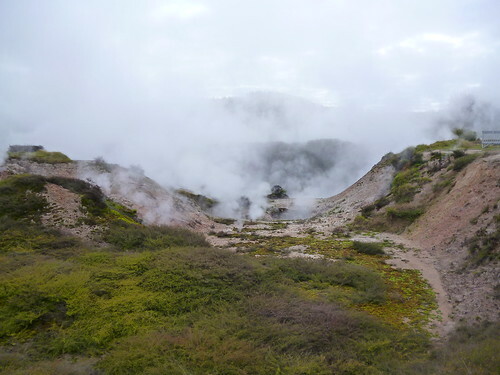 To take our minds off it, we visited a nearby attraction to kill some time: the Craters of the Moon. 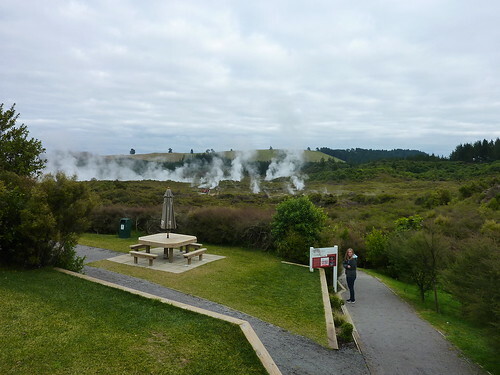 These are simply thermal vents which have formed in a smallish area, which has allowed the government to plant a boardwalk, and in true tourist trap style, some local genius has given a fantastical name to the whole shebang in order to draw in the punters. 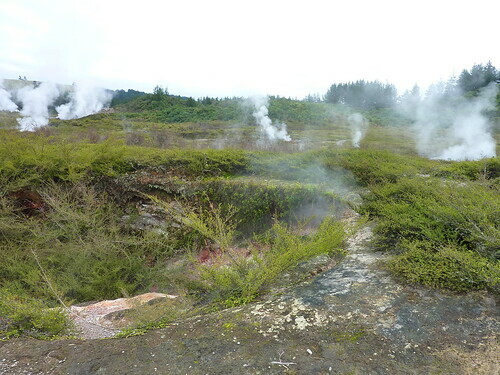 I may be a little harsh here; it wasn't a bad walk by any means, but it felt a little pedestrian after visiting the thermal village only a few days earlier. 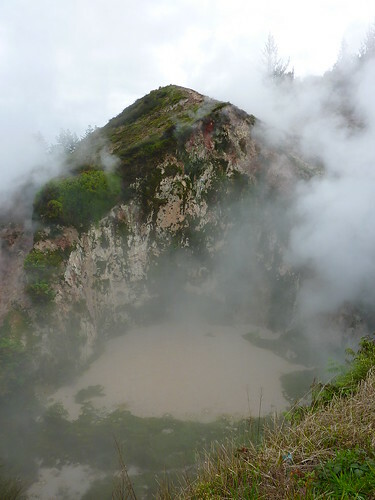 There were plenty of chances to get the obligatory "surrounded by smelly steam" and "bubbling mudpool" photos, so we did. As can be seen, the sky was starting to brighten up and blue sky was peeking through. A phone call to TTS confirmed that, yes, all systems were go for chucking us out of a plane. We got to the office/airfield and handed over our cash. I decided to splash out on a video and some photos since I probably wasn't going to be doing it again (and definitely not if something went wrong and I splatted in a field). We had plenty of time to get kitted up, and also watch a batch of suicidal folk who were there before us come floating in on their parachutes to a nearby field. The instructors do multiple dives per day - they landed, dumped their 'chutes in the kit area, said goodbye to the people whose lives they had just endangered/saved, and then came over to us to do the whole thing again. As jobs go, it's certainly unique. "Oh, the same thing I did yesterday, sweetie: jumped out of a plane ten times, managed not to die, then came home." 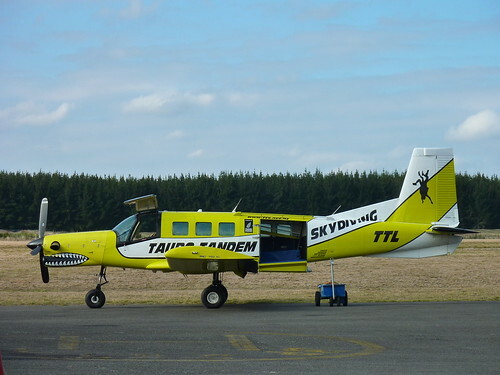 I should mention the aeroplane, or perhaps "sardine tin" would be a more appropriate description. Ever been in a plane where you can't stand up? Me neither. This thing was tiny. It was soon time to get into our fashionable jumpsuits and harnesses. Oddly, I felt a lot more jittery waiting to go up in the plane than I had the entire time I was waiting for the bungy jump and my stomach was not too pleased with me. My tandem buddy was Tim, and he was ably assisted by a photographer/videographer Elad who not only needed to concentrate on how close he was to hitting the ground, but also make sure he got some super awesome video and photos of me looking super awesome and doing lots of super awesome things (it later turned out that these were mainly falling and whooping). Gilly's instructor was a guy called Brad Rock, a name more suited to professional wrestling. He was great at putting her at ease though, with his comments such as "Oh, that doesn't look good." and "Hmm, I think this strap is supposed to be done up." Sounds odd, but it seemed to work a treat; she was laughing too much to worry about dying. 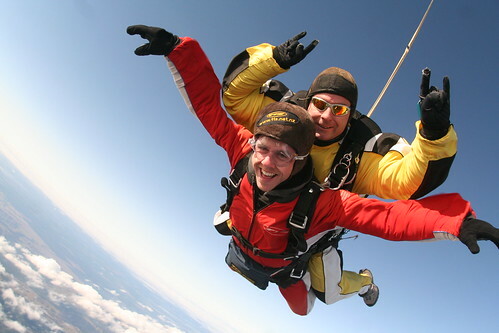 There are a few options for skydiving - you can either go to 12,000 feet which gives you about 30 seconds of freefall, or 15,000 feet which lasts for about 60 seconds. There's only one way to go, of course, which is as high as possible. This is what we chose. Choosing a higher jump means that you have to wait in the plane and watch everyone else who is doing a lower altitude jump go before you. Seeing people literally fall out of a plane is a surreal experience, and it's at this point that the reality of what you are about to do kicks in. My buddy started attaching clips and buckles to me as we ascended close to the jump level. 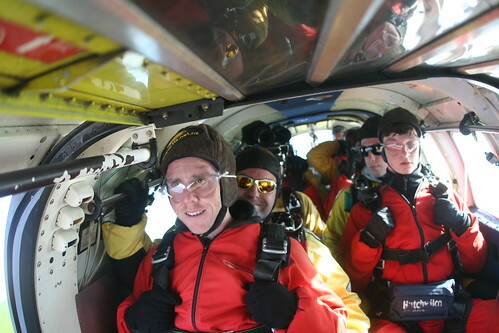 In the plane we were all sat down, jumpers in front of their instructors. This is how much space I had after a couple of people had bailed out. Gilly was right at the back and one of the last to go. Soon enough it was my turn, and I barely had time to grin manically for the exit photo before Elad clung to the outside of the plane and Tim pushed me out....and we were all falling. 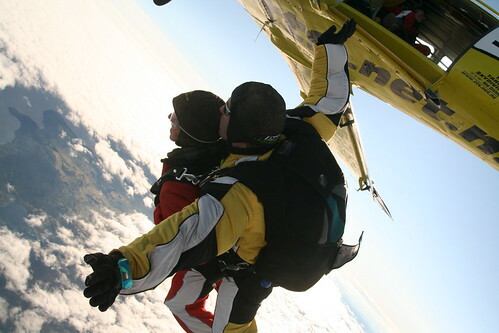 The first thing to get released is a small chute to slow down the descent for you to enjoy maximum freefall time. 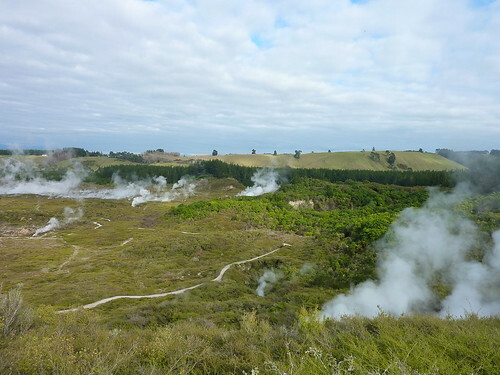 Taking in the North Island from the air is beyond words. 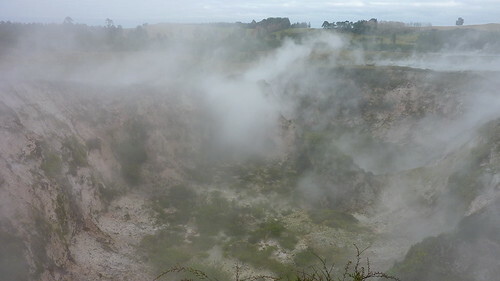 Lake Taupo stretched out in its huge entirety, and in every direction I could see tiny forests and settlements; it was like looking at a map. How did it feel? The best word to describe it is "safe". This is probably counter-intuitive given what I was actually doing (plunging to the ground), but it was less an adrenaline-filled screamfest and more of a comfortable, exhilarating experience. 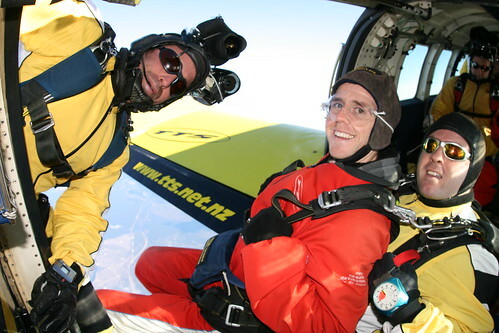 At no point was I worried that something might go wrong; it was completely different to bungy jumping and I had complete confidence in Tim's abilities to land us safely. 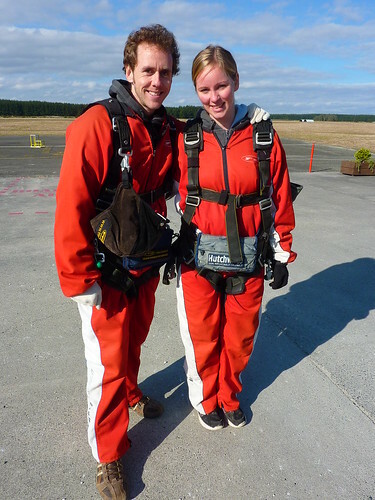 After a minute of freefalling, during which the cold air was literally pulling the tears out of my eyes faster than I could create them, the main parachute was released and we descended at a more sedate pace which allowed us to take in the incredible surroundings. The world's horizon actually appears curved rather than flat from the sky, and I am beginning to understand the interest in space tourism. Tim then let me take the reins - literally. I was able to steer the parachute left and right by pulling down on the opposite cord, and it made us spin around so quickly that I actually felt queasy. 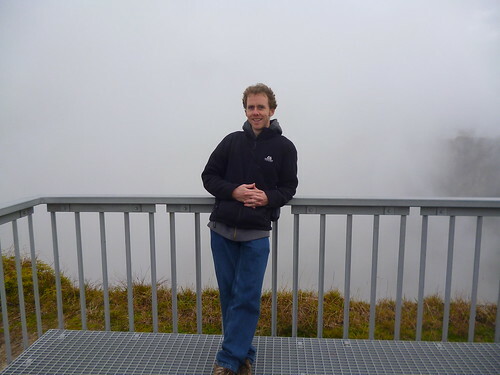 I was pretty relieved once we stopped spinning and just started descending. Tim pointed out various landmarks but I was so overwhelmed by having jumped out of a plane that I must confess I couldn't recall them if you paid me. Except for the lake. That was pretty big. It was soon time for the splashdown. Possibly broken legs aside, it was simple: stick your legs out and into a seated position, and land on your backside. Sounds painful, but it really wasn't. Gilly showed everyone up by landing in an upright position. I think she may have a stunt role in the next Bond film. The compilation video of our jump is below - even though Gilly didn't buy the pack she is still on the video, which is great. 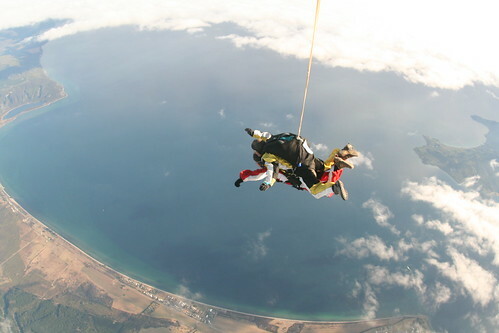 The comparison between bungy jumping and skydiving is interesting. For me, the former is far more terrifying. Perhaps it's the necessity of actually making the jump yourself, rather than being pushed. Maybe it's the risk of getting everything from detached retinas to dislocations even if the bungy jump goes correctly compared to, hmm, smashing in a bloody heap. It could be the lack of someone jumping with you who you could feasibly flip over and use as a human pillow if the parachute failed. Whatever the reason, if it's a terrifying rush you're after then bungy jumping is for you. 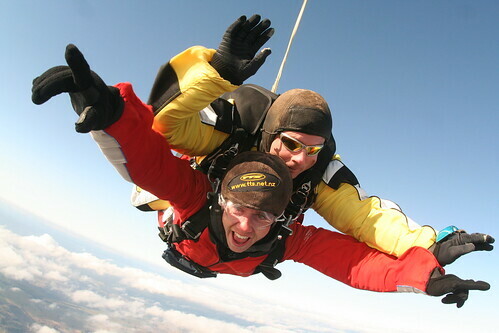 If you want to see the world from a great height but still feel protected, skydiving is the way to go. It was over, we'd survived, and we had the certificate to prove it. 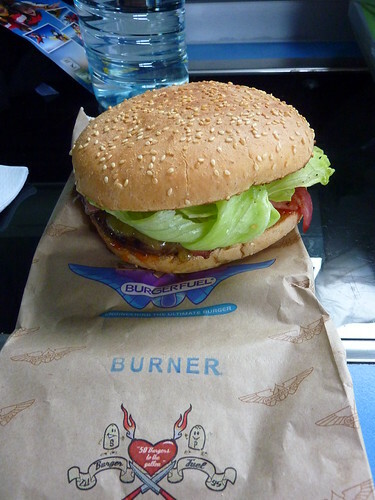 Nothing builds up an appetite like a minute of freefall, so the TTS staff kindly pointed us in the direction of Burgerfuel, where a cheeseburger with jalapenos ominously named "The Burner" awaited me. It tasted like life, although the cow probably didn't think so. A quick pint at a local bar was next to nab some wi-fi and plan our next stop. 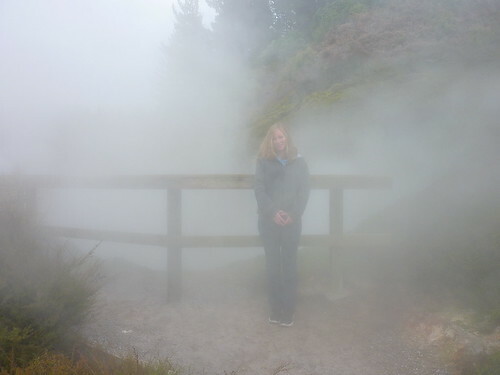 We were going to be staying in Wellington with my former work colleague Sharon, a native Kiwi who had been working in the same UK company as me on a visa, and had returned home a couple of years ago. 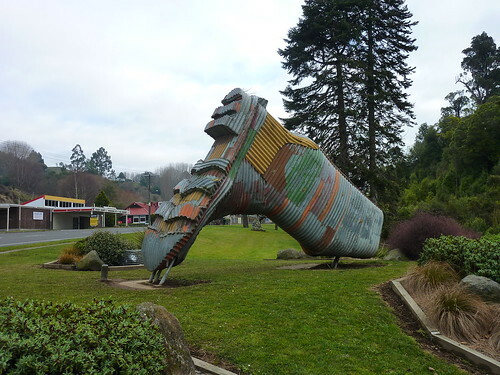 After making sure everything was fine for our arrival, we drove most of the way down south from Taupo and through Taihape - the gumboot capital of the world - before finding a holiday park for the night.